Rhonda, my dear friend and most enthusiastic fan surprised me AGAIN! Look at the shirts she had made from the team buttons. I'm absolutely stunned and can't wait to wear mine! The artist did an amazing job. 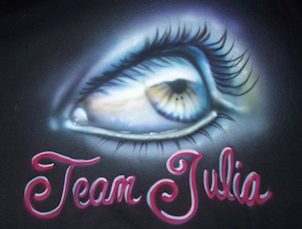 I didn't know people could airbrush like this. These types of moments make being an author so much fun! On another note, I need a little help. I've had over 50 written reviews on GoodReads, but only 15 on Amazon . Reviews help with my ranking so others can find my books when searching. BOOKBLOGGERS: If you could take a moment to put your review on B&N and Amazon, I'd be ETERNALLY grateful! It is because of YOU that I've succeeded thus far and I appreciate it from the bottom of my heart! Hello! Is it already *gasp* February? Here's where I was just a few short days ago for my brothers wedding... sigh. So lovely. But, I am home now, writing feverishly (and buried in taxes)! I want your fulfillment in Nicholas and Julia and *cough* others story's with the third installment, The Onyx Talisman come late 2011. My ebooks have DROPPED massively in price! 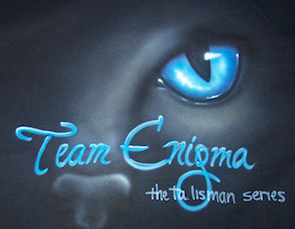 The Emerald Talisman is now $.99 and The Sapphire Talisman is $3.99 for Nook/Kindle. Also, it's going to be available on iBooks shortly. Also, to celebrate, I'm doing a goodreads giveaway! 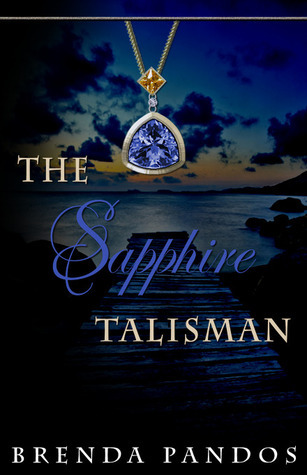 Retweeters with #sapphiretalisman hash and comment givers (with email) will be put in a special drawing for swag! Giveaway ends March 15, 2011.